Following the conclusion of BlazBlue Central Fiction‘s tournament segment at EVO this year, Arc System Works had two announcements to make: a new DLC character and an unexpected cross-over title. Arc System Works is best known in the gaming industry for their 2D fighters, most notably Guilty Gear (first released in 1995) and BlazBlue (2008), publishing cult hits like Persona 4 Arena Ultimax and Dragon Ball FighterZ as of late. The new DLC character making his playable premiere in BlazBlue Central Fiction is Jubei, allowing fans to finally play as the long standing NPC. Jubei is said to be an agile fighter with moves capable of crossing through his opponent. His distortion drive alters his specials and drives to allow for unorthodox neutral game mix-ups. Read the details here, courtesy of @GREATFERNMAN. Jubei’s expected release will be later this summer, as noted at the end of his DLC reveal. Even more exciting is the newly announced game entitled BlazBlue Cross Tag Battle. 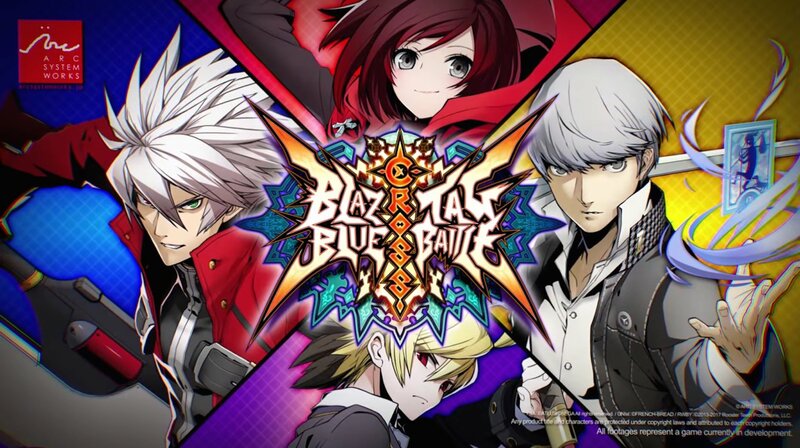 The game features not only BlazBlue characters like Ragna and Jin, but also Yu Narukami from Persona 4, Hyde from the lesser known Under Night In-Birth Exe:Late (UNIEL), and Ruby from Rooster Teeth’s RWBY. The new game appears to be a 2D, sprite based, 2v2 tag-team fighter. Presumably for consoles, the game will be officially launched sometime in 2018. Watch the BlazBlue Cross Tag Battle trailer here, or peruse our image gallery below.